This article is about the office of chancellor in Germany throughout its history. For the office of Chancellor of the Federal Republic of Germany, see Chancellor of Germany (1949–present). The title Chancellor has designated different offices in the history of Germany. It is currently used for the Chancellor of the Federal Republic of Germany (German: Bundeskanzler(in) der Bundesrepublik Deutschland), the head of government of Germany. The term, dating from the Early Middle Ages, is derived from the Latin term cancellarius. The modern office of chancellor evolved from the position created for Otto von Bismarck in the North German Confederation in 1867; this federal state evolved into a German nation-state with the 1871 Unification of Germany. The role of the chancellor has varied greatly throughout Germany's modern history. Today, the chancellor is the country's effective leader, although in formal protocol, the Bundespräsident and Bundestagspräsident are ranked higher. In German politics, the chancellor is the equivalent of a prime minister in many other countries. The chancellor is elected by the Bundestag. The current, official title in German is Bundeskanzler(in), which means "Federal Chancellor", and is sometimes shortened to Kanzler(in). The 8th and current chancellor is Angela Merkel, who is serving her fourth term in office. She is the first female chancellor. The title of Chancellor has a long history, stemming back to the Holy Roman Empire, when the office of German archchancellor was usually held by Archbishops of Mainz. The title was, at times, used in several states of German-speaking Europe. The modern office of chancellor was established with the North German Confederation, of which Otto von Bismarck became Bundeskanzler (meaning "Federal Chancellor") in 1867. With the enlargement of this federal state to the German Empire in 1871, the title was renamed to Reichskanzler (meaning "Reich Chancellor"). With Germany's constitution of 1949, the title of Bundeskanzler was revived. During the various eras, the role of the chancellor has varied. From 1867 to 1918, the chancellor was the only responsible minister of the federal level. He was installed by the federal presidium (i.e. the Prussian king; since 1871 called Emperor). The Staatssekretäre were civil servants subordinate to the chancellor. Besides the executive, the constitution gave the chancellor only one function: presiding over the Federal Council, the representative organ of the states (together with the parliament the law maker). But in reality, the chancellor was nearly always installed as minister president of Prussia, too. Indirectly, this gave the chancellor the power of the Federal Council, including the dissolution of parliament. Although effective government was possible only on cooperation with the parliament (Reichstag), the results of the elections had only an indirect influence on the chancellorship, at most. Only in October 1918, the constitution was changed: it required the chancellor to have the trust of the parliament. Some two weeks later, Chancellor Max von Baden declared the abdication of the emperor and ceded power illegally to the revolutionary Council of People’s Delegates. According to the Weimar Constitution of 1919, the chancellor was head of a collegial government. The chancellor was appointed and dismissed by the president, as were the ministers, upon proposal by the chancellor. The chancellor or any minister had to be dismissed if demanded by parliament. As today, the chancellor had the prerogative to determine the guidelines of government (Richtlinienkompetenz). In reality this power was limited by coalition government and the president. When the Nazis came to power on 30 January 1933, the Weimar Constitution was de facto set aside. After the death of President Hindenburg in 1934, Adolf Hitler, the dictatorial party leader and chancellor, took over the powers of the president. The new official title became Führer und Reichskanzler (meaning "Leader and Reich Chancellor"). The 1949 constitution gave the chancellor much greater powers than during the Weimar Republic, while strongly diminishing the role of the president. Germany is today often referred to as a "chancellor democracy", reflecting the role of the chancellor as the country's chief executive. Since 1867, 33 individuals have served as heads of government of Germany, West Germany, or Northern Germany, nearly all of them with the title of Chancellor. Due to his administrative tasks, the head of the clerics at the chapel of an imperial palace during the Carolingian Empire was called chancellor (from Latin: cancellarius). The chapel's college acted as the Emperor's chancery issuing deeds and capitularies. Since the days of Louis the German, the archbishop of Mainz was ex officio German archchancellor, a position he held until the end of the Holy Roman Empire in 1806, while de jure the archbishop of Cologne was chancellor of Italy and the archbishop of Trier of Burgundy. These three prince-archbishops were also prince-electors of the empire electing the King of the Romans. Already in medieval times, the German chancellor had political power like Archbishop Willigis (archchancellor 975–1011, regent for King Otto III of Germany 991–994) or Rainald von Dassel (Chancellor 1156–1162 and 1166–1167) under Emperor Frederick Barbarossa. In 1559, Emperor Ferdinand I established the agency of an imperial chancellery (Reichshofkanzlei) at the Vienna Hofburg Palace, headed by a vice-chancellor under the nominal authority of the Mainz archbishop. Upon the 1620 Battle of White Mountain, Emperor Ferdinand II created the office of an Austrian court chancellor in charge of the internal and foreign affairs of the Habsburg Monarchy. From 1753 onwards, the office of an Austrian state chancellor was held by Prince Kaunitz. The imperial chancellery lost its importance, and from the days of Maria Theresa and Joseph II, merely existed on paper. After the dissolution of the Holy Roman Empire, Prince Metternich served as state chancellor of the Austrian Empire (1821–1848), likewise Prince Hardenberg acted as Prussian chancellor (1810–1822). The German Confederation of 1815-1866 did not have a government or parliament, only the Bundestag as representative organ of the states. The head of the federal government of the North German Confederation, which was created on 1 July 1867, had the title Bundeskanzler. 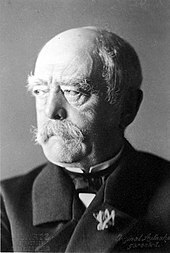 The only person to hold the office was Otto von Bismarck, the prime minister of Prussia. The king, being the bearer of the Bundespräsidium, installed him on 14 July. Under the constitution of 1 January 1871, the king had additionally the title of Emperor. The constitution still called the chancellor Bundeskanzler. This was only changed in the new constitution of 16 April 1871 to Reichskanzler. The office remained the same, and Bismarck was not even re-installed. In the 1871 German Empire, the Reichskanzler ("Imperial Chancellor") served both as the emperor's first minister, and as presiding officer of the Bundesrat, the upper chamber of the German parliament. He was neither elected by nor responsible to Parliament (the Reichstag). Instead, the chancellor was appointed by the emperor. the federal executive, first led by Otto, Fürst von Bismarck, the Minister-President of Prussia, as chancellor. Technically, the foreign ministers of the empire's states instructed their states' deputies to the federal council (Bundesrat) and therefore outranked the chancellor. For this reason, Prince Bismarck (as he was from 1871 onwards) continued to serve as both prime minister and foreign minister of Prussia for virtually his entire tenure as chancellor of the empire, since he wanted to continue to exercise this power. Since Prussia controlled seventeen votes in the Bundesrat, Bismarck could effectively control the proceedings by making deals with the smaller states. The term chancellor signalled the seemingly low priority of this institution compared to the governments of the German states, because the new chancellor of the federal empire should not be a full-fledged prime minister, in contrast to the heads of the states. The title of chancellor additionally symbolized a strong monarchist, bureaucratic, and ultimately antiparliamentary component, as in the Prussian tradition of, for instance, Hardenberg. In both of these aspects, the executive of the federation, and then empire, as it was formed in 1867 and 1871, was deliberately different from the Imperial Ministry of the revolutionary years 1848/49, which had been led by a prime minister elected by the National Assembly. In 1871, the concept of the federal chancellor was transferred to the executive of the newly formed German Empire, which now also contained the South German states. Here too, the terms of “chancellor” and “federal agency” (as opposed to “ministry” or “government”) suggested an (apparent) lower priority of the federal executive as compared to the governments of the federal states. For this reason, neither the chancellor nor the leaders of the imperial departments under his command used the title of Minister until 1918. The constitution of Germany was altered on 29 October 1918, when the parliament was given the right to dismiss the chancellor. However, the change could not prevent the outbreak of a revolution a few days later. On 9 November 1918, Chancellor Max von Baden handed over his office of chancellor to Friedrich Ebert. Ebert continued to serve as head of government during the three months between the end of the German Empire in November 1918 and the first gathering of the National Assembly in February 1919, but did not use the title of Chancellor. During that time, Ebert also served as chairman of the "Council of the People's Deputies", until 29 December 1918 together with the Independent Social Democrat Hugo Haase. The office of chancellor was continued in the Weimar Republic. The chancellor (Reichskanzler) was appointed by the president and was responsible to the parliament. Under the Weimar Republic, the chancellor was a fairly weak figure. Much like his French counterpart, he served as little more than a chairman. Cabinet decisions were made by majority vote. In fact, many of the Weimar governments depended highly on the cooperation of the president, due to the difficulty of finding a majority in the parliament. Adolf Hitler was appointed chancellor of Germany on 30 January 1933 by Paul von Hindenburg. Upon taking office, Hitler immediately began accumulating power and changing the nature of the chancellorship. After only two months in office, and following the burning of the Reichstag building, the parliament passed the Enabling Act giving the chancellor full legislative powers for a period of four years – the chancellor could introduce any law without consulting Parliament. Powers of the chancellor continued to grow until August 1934, when the incumbent President Paul von Hindenburg died. Hitler used the Enabling Act to merge the office of chancellor with that of the president to create a new office, "the leader". Although the offices were merged, Hitler continued to be addressed as "Führer und Reichskanzler" indicating that the head of state and head of government were still separate positions, albeit held by the same man. This separation was made more evident when, in April 1945, Hitler gave instruction that upon his death the office of leader would dissolve and there would be a new president and chancellor. On 30 April 1945, when Hitler committed suicide, he was briefly succeeded as chancellor by Joseph Goebbels, as dictated in Hitler's will and testament. With Goebbels following Hitler's suicide with his own, the reins of power passed to Grand Admiral Karl Dönitz as president of Germany. Dönitz, in turn, appointed conservative Count Schwerin von Krosigk as head of government with the title “Leading Minister”. The 1949 German constitution, the Basic Law (Grundgesetz), invests the chancellor (German, Bundeskanzler) with broad powers to initiate government policy. For that reason, some observers refer to the German political system as a "chancellor democracy". Whichever major party (CDU/CSU or SPD) does not hold the chancellorship usually calls its leading candidate for the federal election "chancellor-candidate" (Kanzlerkandidat). The federal government (Bundesregierung) consists of the chancellor and his or her cabinet ministers. The chancellor's authority emanates from the provisions of the Basic Law and in practice from his or her status as leader of the party (or coalition of parties) holding a majority of seats in the Bundestag (federal parliament). With the exception of Helmut Schmidt, the chancellor has also been chairman of his or her own party. This was the case with Chancellor Gerhard Schröder from 1999 until he resigned the chairmanship of the SPD in 2004. The German chancellor is officially addressed as "Herr Bundeskanzler" if the chancellor is a man. The current holder of this office, Angela Merkel, considered to be the planet's most influential woman by Forbes Magazine, is officially addressed as "Frau Bundeskanzlerin", the feminine form of the title. Use of the mixed form "Frau Bundeskanzler" was deprecated by the government in 2004 because it is regarded as impolite and was seen as a way of acknowledging Merkel's future leadership. ^ Ratgeber für Anschriften und Anreden. (PDF; 2,3 MB) Bundesministerium des Innern - Protokoll Inland, Retrieved January 2010. ^ The Chancellor is elected by the Bundestag, normally on the proposal of the Federal President and without debate (Article 63 of the German Constitution). ^ She is known in German as Bundeskanzlerin. Bundeskanzlerin is a grammatically regular formation of a noun denoting a female chancellor, adding "-in" to the end of Bundeskanzler, though the word was not used officially before Merkel. Klein, Herbert, ed. 1993. The German Chancellors. Berlin: Edition. Padgett, Stephen, ed. 1994. The Development of the German Chancellorship: Adenauer to Kohl. London: Hurst. Harlen, Christine M. 2002. "The Leadership Styles of the German Chancellors: From Schmidt to Schröder." Politics and Policy 30 (2 (June)): 347–371. Helms, Ludger. 2001. "The Changing Chancellorship: Resources and Constraints Revisited." German Politics 10 (2): 155–168. Mayntz, Renate. 1980. "Executive Leadership in Germany: Dispersion of Power or 'Kanzler Demokratie'?" In presidents and Prime Ministers, ed. R. Rose and E. N. Suleiman. Washington, D.C: American Enterprise Institute. pp. 139–71. Smith, Gordon. 1991. "The Resources of a German Chancellor." West European Politics 14 (2): 48–61. This page is based on the Wikipedia article Chancellor of Germany; it is used under the Creative Commons Attribution-ShareAlike 3.0 Unported License (CC-BY-SA). You may redistribute it, verbatim or modified, providing that you comply with the terms of the CC-BY-SA.